Yu Bin, director-general of the Department of Macroeconomic Research of the DRC, made a speech on the development prospect of China's economy in 2013. Ye Xingqing, director-general of the Research Department of Rural Economy of the DRC, said the attention should be given to the equalization of basic public service in urbanization process. Wu Jinglian, research fellow and honorary director-general of the Institute of Market Economy, the Development Research Center of the State Council (DRC), made a speech about comprehensive reform. Ren Xingzhou, director-general of the DRC's Institute of Market Economy said land finance pushed housing price up. Ye Xingqing, director-general of the DRC's Research Department of Rural Economy, interpreted Chinese government's move to stabilize policies, promote reform and innovation, and maintain sustainable development, in issues of agriculture, farmer, and rural areas. 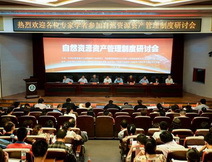 Wu Jinglian made a speech on reform planning. A seminar on natural resource assets management system. DRC research group made a survey in Jimo city, East China's Shandong province.